These guys could not keep this news to themselves. They had front row tickets to the most amazing heavenly concert ever given, complete with angelic worship team. Then they had front row tickets to see God in the flesh. This was definintely something to pass along to others. I wonder what it was like on the hillside near Bethlehem that night. One minute the shepherds were just going about their business, and the next minute they were staring into the face of an alien being. Their spontaneous response was first to run to Bethlehem to see what God was up to, and then to tell everyone who would listen. As I shared in yesterday’s blog, God calls us to pass this Good News along, too. To “re-gift” the gift of our Savior and to “Go Tell It On The Mountains.” In order to inspire us in this, I wanted to share a video that was first posted on YouTube just over a month ago and has already received more than 24 million hits. It has gone “viral” (which I love, since this video points to the Messiah). P.S. Before I share the video, here’s a quick note. 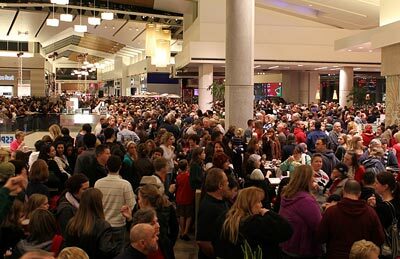 Last night, I attempted to attend another “flash mob” that was set to sing the “Hallelujah Chorus” at the Galleria in Roseville, CA, but so many people showed up (more than 5,000) that the police and fire marshall ended up evacuating the entire mall for safety reasons. While I was sad that I didn’t get to participate in this event, I couldn’t help thinking about the millions of people in the world who will be crowding into the malls this week, looking for something this Christmas. Many are mistakenly looking to fill the God-shaped void inside with something they can buy in a store. They are hungry for God – and many don’t even realize it. 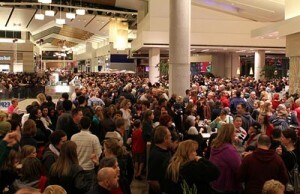 Thousands of people were crowding into the Galleria last night, looking to participate in something bigger than themselves, something that would fill their hearts with joy. What they were really looking for was an experience of the transcendent – an experience of God. That is what the whole world is looking for this Christmas, whether they know it or not. Even when there is “no room in the inn” – or in the mall – that won’t stop God from breaking into people’s lives. That’s because God uses every day, ordinary people like you, me, and the shepherds to join the angels in singing about the Good News. We’re called to take it to the streets and become a “flash mob” wherever we happen to find ourselves today.